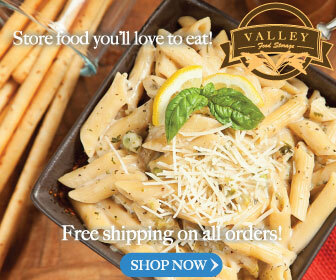 I like Valley Food Storage because they have no GMOs, no MSG, no fillers, and no hydrogenated oils. They have gluten free and dairy free options for those who need them, and you can create custom food storage kits by selecting only those food items you prefer. If you want to build up your food storage over time, they have monthly purchase plans that ship a set amount of feed each month. For the best pricing, you can purchase bulk kits designed for 1 month, 3 months or 1 year. Like many prepackaged long term storage meals, these meals are light on meat. I plan accordingly for our family, supplementing with fresh, frozen, canned or freeze dried proteins as appropriate. Numanna offers food storage that is free of GMOs, HFCS, MSG, aspartame, soy and chemical preservatives. They have gluten free and organic options, as well as a Defender Nutritive Pack, which includes quinoa, chia seeds, brown rice, spelt, parboiled rice and a sprouting seed pack in addition to the meals for more calories and extra nutrients. MaryJanesFarm features 100% organic meals. Bags can be ordered as singles online from Amazon.com, or directly from their online store. The ingredient lists are short, which I like. The meals are popular in with those involved in backpacking and other outdoor activities because they are packed in an EcoPouch. This packaging allows you to heat and rehydrate the meal in the pouch by adding boiling water. No pot or extended cooking required. This would obviously be a plus for emergency situations, too, because you wouldn't need to wash extra cooking vessels. Augason Farms stocks an assortment of meals, but some of them contain ingredients that we try to avoid, like hydrolyzed soy protein. I like their basic freeze dried vegetables (broccoli, peas, and corn) and fruit (apples and bananas). They also stock real meat – freeze dried beef and chicken chunks. No monthly subscription is required, unlike Thrive Life Freeze Dried Foods. They are available online and through a variety of retailers. Foods come packed in #10 cans, which can be resealed, but for best quality you may want to vacuum seal leftovers if they are not expected to be used in a short amount of time. By far the widest range of freeze dried foods can be found from your own home freeze drier. 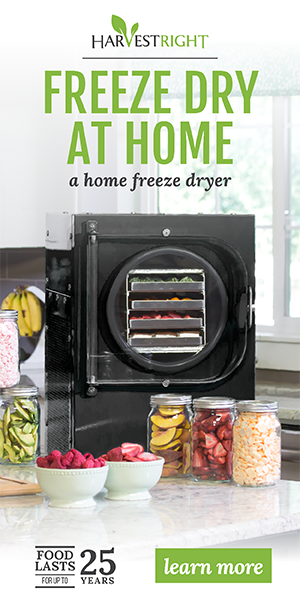 Earlier this HarvestRight Home Freeze Dryers gave me the opportunity to purchase a home freeze dryer at a discount. For the past several months, we've been experimenting with a variety of foods. The results have been delicious. In online freeze dryer groups, people are freeze drying everything from flavored oatmeal to jumbo shrimp – all with good results. The only foods that don't freeze dry well are those that are extremely high in fat – like butter – or very high in sugar – like jam. There's very little water to be pulled out of oil, and the sugar binds to the water in high sugar foods so it cannot be pulled out. While we have stocked up on an assortment of pre-made meals, from this point forward the majority of our freeze dried food storage will be home freeze dried food. We store our home freeze dried items in mason jars or Mylar bags with oxygen absorbers. How Long Does Freeze Dried Food Last? How Does Freeze Dried Food Taste? Freeze dried food tastes like food. The better the quality you start with, the better the finished product. Herb flavor profiles stay true, so make sure to look for ingredient lists with food that you like. For instance, the dried potato soups were pretty universally bland, but other dishes can be loaded with cilantro or jalapenos, or high in sugar. Label reading is still a good idea. Unlike standard dehydrated food, freeze dried food is light and airy when dried, not leathery. Freeze dried food also tends to rehydrate more quickly – although we often eat plain fruits and veggies without rehydrating. The meal sizes are not huge. They are not intended to be a substitute for a 1250 calorie MRE or 3600 calorie emergency food bar. When we were testing meals, we often paired them up with additional meat and veggies for our family of four (including 2 teen boys). Which Food Storage Option is Best? My family and I use a variety of food storage options – including root cellaring, canning, freezing, and dehydrating – as well as freeze drying. I really like the super long shelf life of freeze dried foods. Nothing else can match it. The food tastes good, and I expect to keep freeze drying for many years to come. Experiment with different food preservation techniques and food storage brands and find the combination that works best for your family. Have you tried freeze dried food? What's your favorite option? We experimented with freeze dried foods a few years ago. Top indulgence choice was freeze dried peaches labelled unsweetened, but fabulously sweet and ambrosially peachy. Next fave was asparagus, followed by green beans and sliced agaricus (button) mushrooms. We got a 1 year package that included a selection of salted meat that had a number of ingredients you sought to avoid. My husband was not deterred and mowed through those cans like they were popcorn He said: “They’re ok.” Similar situation with the soup blends. We were hesitant to invest in further experiments and profoundly appreciate the research you have done. We can budget to build a new emergency supply while still digging away at improving our soil, yields and root cellar-type storage. A word of caution about buying freeze dried commercial or organic strawberries: The organic standard permits the use of mercuric bromide, an anti-fungal soil additive, on organic crops,. If you want to gobble freeze dried strawberries, you might want to grow your own. It’s pretty frustrating that organic certification doesn’t mean “safe”. It just keeps getting harder and harder to avoid crap in our food. Even when you grow your own, there’s still a risk of contamination from well water or air pollution. Hi Laurie! Great post! We started stocking up on freeze dried foods a few years ago. I was not happy about some of the unhealthy ingredients in them, but I figured that it was better than having no food at all for emergencies. I haven’t bought any for a while. It’s good to know that there are much healthier options out there. I’ll be checking out these companies and looking into doing my own freeze drying, too. Thanks so much! Hey Laurie, Thanks for the names of some new (to me) companies. Two remarks come to mind however. I often order from Thrive and although a monthly membership type thing is available it is certainly not required. You can order directly on line or go through an independent consultant. 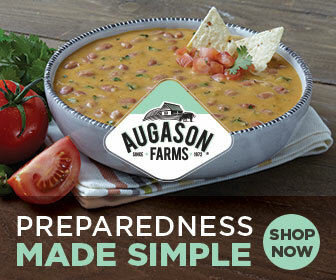 Also, although I like the food I have gotten from Augason Farms, I only order their #10 cans and not their 5 gallon bucket bulk foods. Unlike Thrive, Honeyville and others, Augason only packs their bucket foods directly in the bucket with no mylar bags. It is impossible to tell if the seal has held during shipping. If food has been packed in mylar with oxygen absorbers, when the bucket arrives and you open the gamma top you can see instantly that the vacuum has held. I look forward to exploring the other names you mentioned. Thanks, Leslie. I had a hard time tracking down Thrive. When I did order through a consultant friend, the meals we got were heavy on cilantro. Our family is one of those who find cilantro to taste like soap, so that wasn’t a good fit for us. I went with Auguson in part due to availability, but looking at the Honeyville website and your concerns, Augason may get the bump in favor of Honeyville. Thanks for your feedback! Agree on the Thrive meals. Only order the plain ingredients from almost everyone. Just fruit or just vegetables or just meats, or just grains and beans. We can put them together into some very good meals with just a little help from stocked up pastas, spices or our own canned goods. Just saw your article (a little late, I know) and thought I would put in my 2¢ worth on THRIVE food. Thrive Life really produces a product superior to Augason Farms and Honeyville. In 2009 I owned a retail store and researched all three companies in depth and have followed their improvements ever since. Although AF & H seemed to have quite comparable quality, THRIVE food was quite a bit better quality. Over the years, it seems there has been very little change in most freeze-dried foods and that they all seem to be sourcing from the same places but Thrive Life seems to be developing progressively better quality. I have also visited the facilities of several companies and will say that TL has the cleanest facilities and takes the most care. As far as I know, TL is the only one to offer certified gluten-free and is careful to not contaminate my vegetables with wheat (wheat nor any gluten product is EVER processed on the same equipment or in the same facility) and this is a very important factor to me as it is to many others. Please take a little more time to investigate Thrive Life and take another look. I think you will find that Augason Farms and Honeyville are a toss-up but that Thrive Life is the clear leader for single ingredient foods. Freeze dried meals are light and easy to store, and heat up fairly quickly. For just one person, I would think they would be ideal as an emergency food option.